When starting a new embroidery project using materials I am not familiar with, I first research the “fabric” to see what someone else has already done. This helps me to ensure a successful result. I read up on topics in machine embroidery in general to get new perspectives on things I already know and to add to my “knowledge arsenal”. For example, embroidering on squishy, textured or napped fabrics like towels, sherpa or knit hats. Sure, I know to use a cutaway stabilizer and a topping, but are there other considerations or options that will ensure success? That’s when I hit up my favorite blogs to see if I can find some new to me information on the topic. Machine embroidery has been around long enough so the “pool of knowledge” from those with experience is plentiful and readily available. When I find a blog that has useful information, I bookmark it so that I can come back in the future. 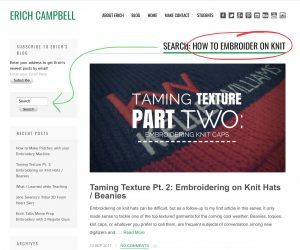 One of the machine embroidery blogs that I follow is written by my friend and colleague, Erich Campbell. Sometimes I feel like a stalker because I’ve been following his writing for years – one day I hope that we will meet in person. I found Erich at the library while combing through printed magazines for commercial embroidery and screen printing. Yes, this was before the intenet was easily searchable. He has an easy going, non-sales pitch style of sharing information. You can read about his machine embroidery background on his website – just click the About Erich link. 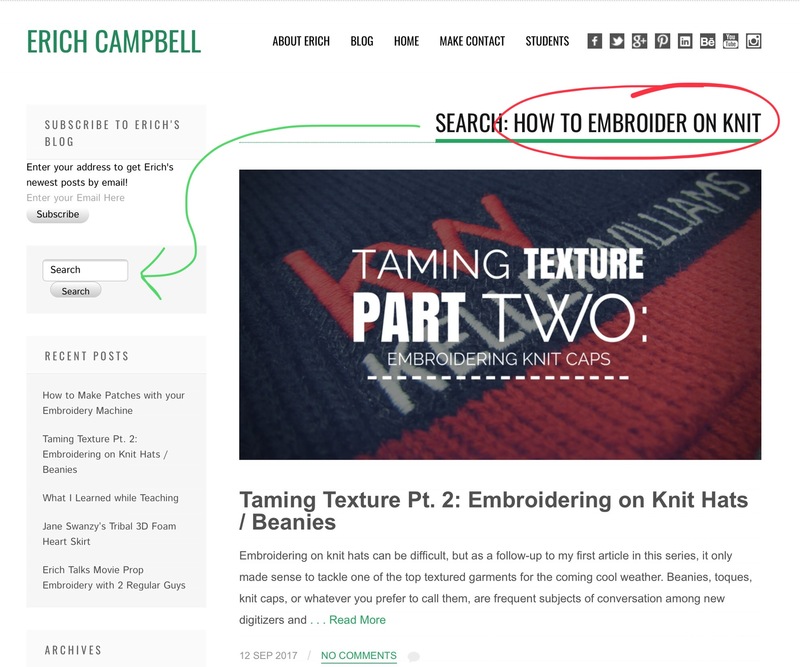 Since I was looking for information on stitching on a knit hat, I searched his blog for “how to embroider on knit”. Most blogs/websites have a search function and this is a better option than Google! I love the various search engines like Google or Bing, but they have too wide of a focus. Searching for this topic on a particular blog on machine embroidery narrows down the possible results tremendously. PLUS, have you noticed that machine embroidery seems to have its own language? When you are searching a blog on machine embroidery, you have a better change of finding information even if you don’t know exactly the right words to search for. ANYWAY, my search on his blog revealed quite a few posts on the topic. The two part series on Taming Texture are the ones that caught my eye. I found my reading material for today! I suggest that you read the Taming Texture Part 1 blog post first. Those that have taken my classes KNOW that I love real life analogies and his infographic of the boardwalk over the grassy field just hit home with me. Might not be as visually shocking as my “Zumba class sports bra analogies” – we don’t want a picture of THAT disaster – but the graphic of the boardwalk maps to stitches of underlay perfectly. Part 1 also talks about knockdown stitching and you KNOW that I just love using the knockdown feature of Embrilliance Enthusiast! If you want to see the “software button” after reading his article on why this is a great technique, check out this video from the Embrilliance youtube channel. The Part 2 post on Taming Texture just blew me away with all the background information! I mean that in a good way! We know that using cutaway stabilizer on a knit is what provides a foundation for the stitches. But a knit hat or beanie or sweater is more than just “a knit”. It has texture and depth and LOTS of stretch and these attributes need to be considered when we embroider them. Not only do I appreciate his observations and explanations of this “fabric type”, but I also found the design suggestions, options and solutions to consider to be very helpful. Not every design can be successfully stitched on every type of fabric but you might have options to “make it work”. Be sure to bookmark and follow those blogs that provide you helpful information! Hopefully you have already bookmarked mine :-). Having a ready list of resources to search at hand will allow you to more efficiently search for the information that you need.